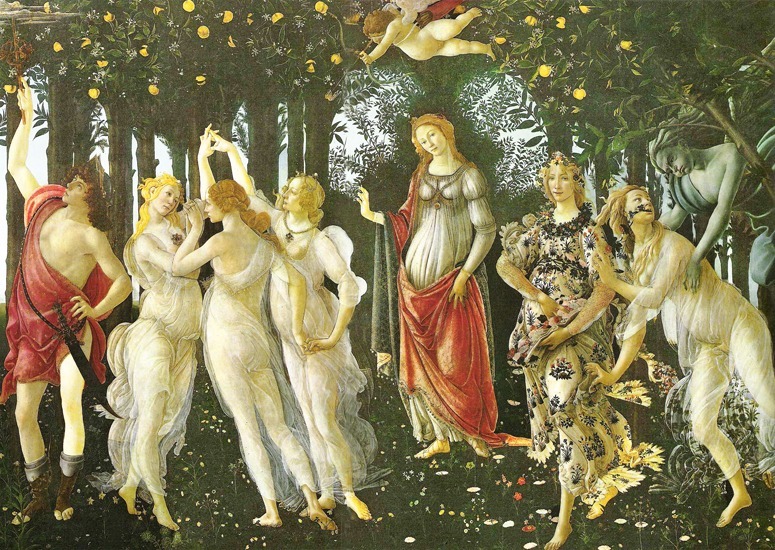 This entry was posted in Garden Design, garden history on 26th October 2011 by Tom Turner. Following upon the discussion of Copenhagen’s Greenfinger Plan, here are two photographs of my hometown. They show examples of ‘urban landscapes’. BUT BUT BUT I do not regard the buildings as ‘urban’ bits and the green bits as ‘landscape’. I regard the scenic composition of buildings+landform+vegetation+paving+water (ie the Five Compositional Elements) as urban landscape compositions. Another reason for calling these examples Urban Landscapes is that they are beautiful. The below photograph of part of what was once of the most important early baroque-influenced gardens in England (Sayes Court, in Deptford) now lacks beauty and I would rather call it an ‘urban wasteland’ than an ‘urban landscape’. Sayes Court was nearly the first place to be saved from demolition by the National Trust. Things didn’t quite work out! Should any elements of the historic design be restored when Convoy’s Wharf is re-developed? The current design looks a bit Dubai-on-Thames but with duller architecture. The developers are Hutchinson Whampoa and the architects are bptw working with Aedas Architecture. This entry was posted in Historic garden restoration, Public parks, Urban Design on 18th October 2011 by Tom Turner. 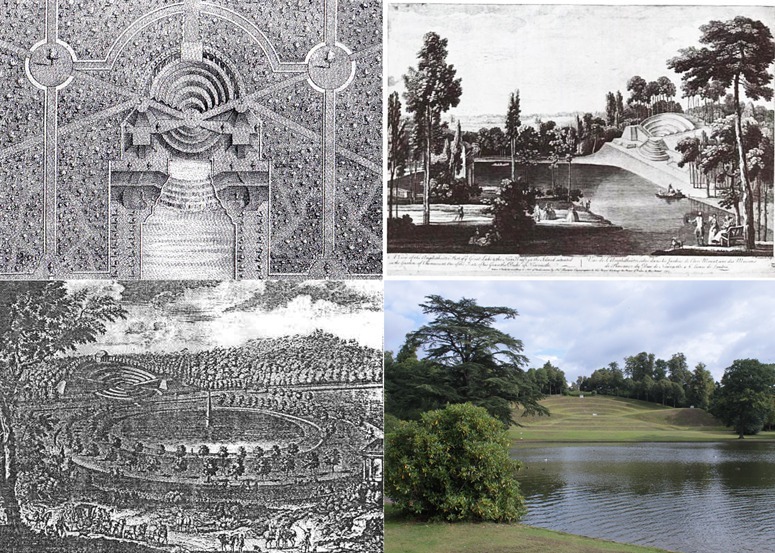 George Hargreaves gave the first Geoffrey Jellicoe lecture to the Landscape Institute yesterday and, in truth, there was something of Jellicoe’s style about it. He began with a terse proposition and then mused through a large set of images. Hargreaves proposition was that the design of public open space takes place around three poles: Site, Sustainability and Memorability. He took us though a portfolio of former projects, so many in fact that common features became obvious: a stylized geometry (which reminded me of Alphand) but projected as sculpture into three dimensions. This worked well on occcasion but, so far as I could see had nothing to do with Site, Sustainability or Memorability. 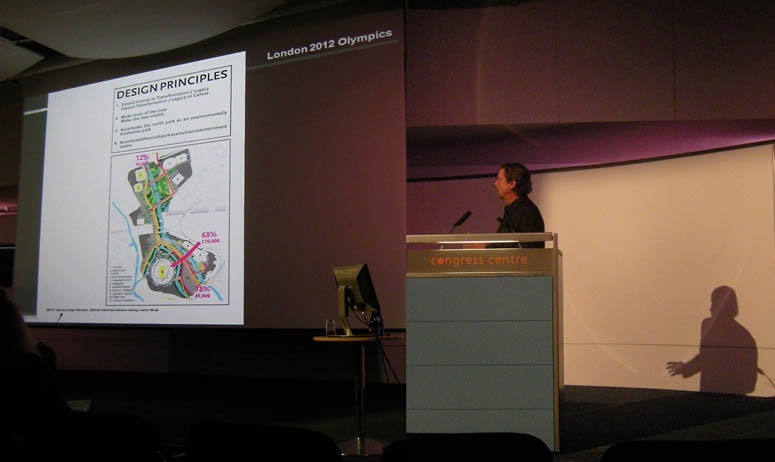 Thinking about the 2012 London Olympics, the first questioner made the point I raised on this webpage when the site was chosen and made again more recently: ‘what about the existing site and its memorability?’ ‘Ha’, said George, ‘we did not concentrate on Memorability for the 2012 Olympic Park. We did not try to keep industrial artifacts because the site was going to have too much traffic’. Note George Hargreaves' shadow, on the left - is he reaching for something? Could it be a design theory? The principles are fine – but I would call these ‘Planning Principles’ and use ‘Design Principles’ when including the aesthetic aspect of the scheme. If Hargreaves gave an explanation of the park’s aesthetic and artistic principles, I missed it. Most probably they are built into his psyche and therefore appear to need no explanation. As a design historian, I would explain it as geometrically Constructivist and thus a compatriot of Abstract Art. It is the curvilinear component of the Abstract Style Diagram. Who’s the professor that made me that way? And Kazimir Severinovich Malevich is his name. Hargreaves was also questioned about the differences between his landscape master plans for the Sydney Olympics and the London Olympics. He explained: ‘they are completely different – at Sydney the river was on the edge of the site and in London it is in the middle’. Site is obviously an important consideration. This entry was posted in Garden Design on 14th October 2011 by Tom Turner. Did they make a mistake with Copenhagen's Green Finger landscape plan? Should Copenhagen's Five Fingers be green or grey? The Danish name is the København 5 Fingerplanen but is described as the Green Finger Plan in the European Landscape Convention and other places. ‘Storkøbenhavn’ means ‘Metropolitan Copenhagen’. This entry was posted in landscape planning, Urban Design on 13th October 2011 by Tom Turner. 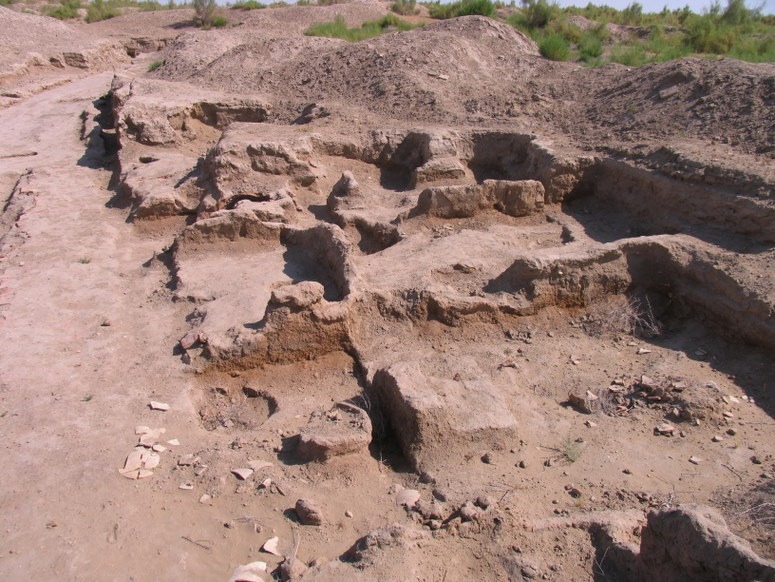 Better not to name it, for fear of attracting more tourists, but this is a silk road city in Central Asia. It was opened up by archaeologists and then left in this condition. The excavators will have published a learned report on their findings. Then they left it like this – as a tourist attraction which the government can put into guidbooks, hoping to create jobs and attract hard currency which can be spent on weapons. Now the rain falls on the mud walls, the sun cracks them, the wind blows the dust away. Far better if the archaeologists had done something useful with their lives, instead of running university courses to teach other archaeologists to support the tourist industry. This entry was posted in Asian gardens and landscapes, landscape and garden archaeology on 11th October 2011 by Tom Turner. 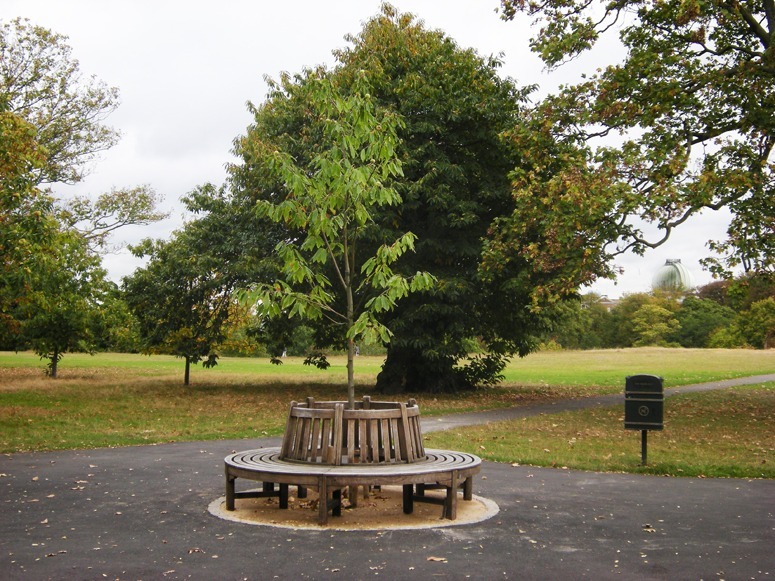 This entry was posted in landscape planning, landscape urbanism, Public parks on 11th October 2011 by Tom Turner. Bridgeman and Switzer and are significant figures in the history of garden design and far too little of their work survives. More of Kent’s work survives. The problem with Claremont is that it lacks the high quality one would expect from such a distinguished cast, though Vanbrugh’s avenue, bowling green and Belvedere Tower are very good. My suggestion is to restore more of the design shown on Switzer’s drawing. I would like to see Switzer’s ‘water spouts’ and the first metre of the baroque canal (it could be done with jetties if there is insufficient land). Restoration of the ‘wilderness’ in which it is set would also be welcome (ie the woodland with straight rides and twisting paths). This would give Claremont a clear separation between (1) the Kentian landscape garden (2) the late baroque features designed by John Vanbrugh, Switzer and Bridgeman. If some way of arranging it could be found, a way of viewing the house and setting which Lancelot Brown designed for Lord Clive would also be highly desireable. The aim should be to make Claremont into first class garden it should be: it is in danger of becoming a public park for the middle classes. This entry was posted in Garden Design, garden history, Garden Visiting, Historic garden restoration on 8th October 2011 by Tom Turner. There used to be a Horse Chestnut tree planted here. It died and was left as a 750mm stump for a few years, in which time it was much used by children and by those parents who liked to see their offspring acting as statues. When the heartwood began to rot they dug up the stump and planted a Sweet Chestnut last month. Yesterday they placed the circular seat around the tree. I see this as a clear indication that the park managers are avid followers of this blog and are hoping the new tree will have a long life. The tree against which it is seen has been there for 350 years. They hope to keep a full copy of the internet on Archive.org – so I hope someone will be able to find this blog post in 3011 and take a photograph of whatever is then growing on this spot. I would also like to know how long the seat will survive (<30 years, I guess) and how long the dog litter bin survives (>100 years, I guess). Dogs used to drop their litter everywhere when I first visited Greenwich (about 30 years ago). Then some good ladies and gentlemen held a Dog Day. One of them stood by each entrance to the park for a day and very politely handed out polythene bags and asked dog owners to collect any droppings from the dogs. The idea caught on and the Royal Parks commissioned these iron dog litter bins. It has been a great success and the park is almost free of dog dirt. As Roland Barthes observed, the droppings of wild animals are inoffensive but those of domesticated pets, and humans, are offensive. Interesting. This entry was posted in garden history, Greenwich Park London, Historic garden restoration, urban forestry on 4th October 2011 by Tom Turner.